I was bursting with pride after her second test. She kept the gerbils in the same general direction and harmed no one in the process. Sure, she was more giraffe than dressage horse, but this show means we are one step closer to become a real dressage pony. All done and all smiles. I won’t keep beating the fact that I’m really happy with Nibbles. I wanted to comment on the experience of the show itself. 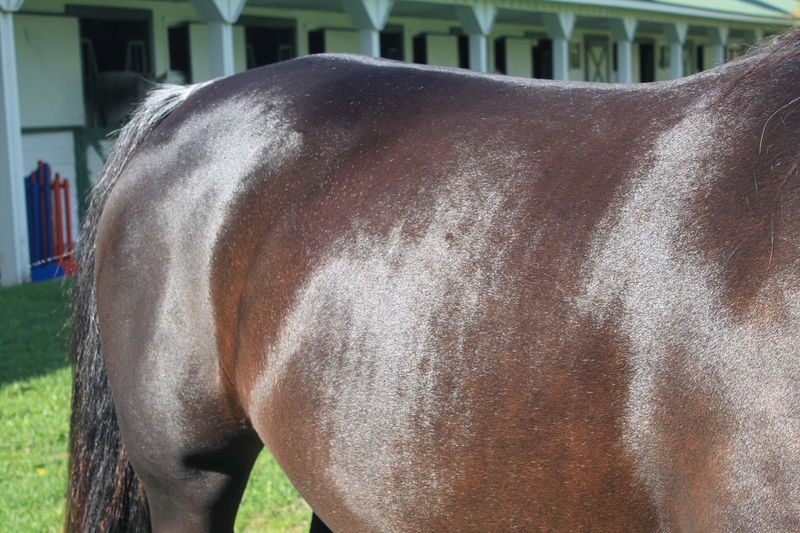 The horse world can get a really bad rap because of how selfish and nasty people can be. I had the exact opposite experience my first time back after 5 years and I think it’s important to talk about. I did not hear one word of gossip or body shaming. Everyone clapped politely and, if anything was whispered, it was about how cute the horse was or how we understood their pain. 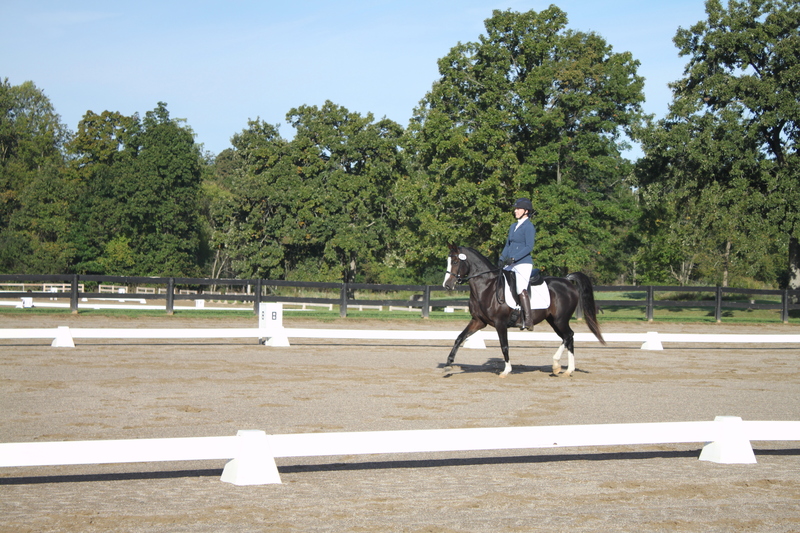 Half pass is hard, canter serpentines are hard, your horse screaming in the middle of the test happens to us all. No one tore anyone down and it was fantastic. 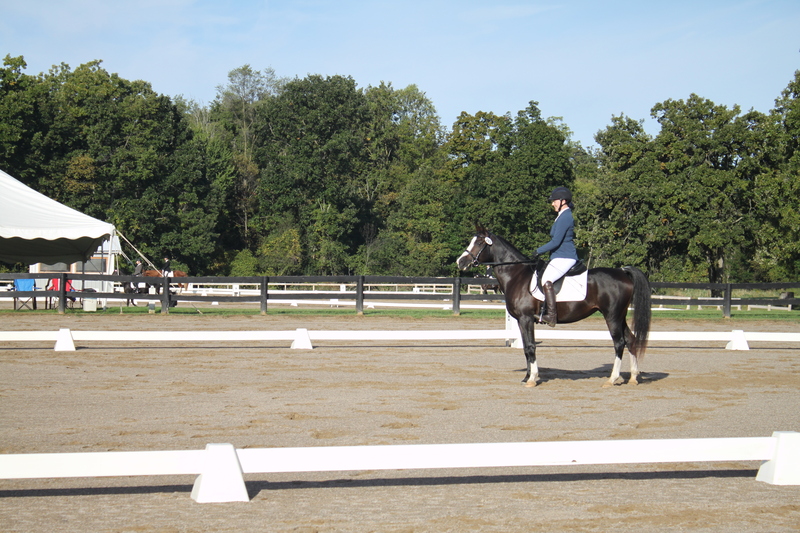 Case in point: I showed up at an open show with an Arabian. Not only were there a handful of other Arabians, I overheard people saying nice things. “Wow, that horse has presence.” “Oh, she’s spirited and beautiful.” “How striking!” Standing on the sidelines, I don’t think people realized I was this horse’s owner which was a great opportunity to potentially hear them talking out of the side of their mouths. If you’re looking for another story about people tearing each other down, you won’t find it here. Not today. Does it get any more adorable? Judges get a bad rap sometimes too. They’re the people who remind you that Ponykins isn’t perfect and your riding needs work. That is, you know, what you pay them for. Nibbles didn’t even break 60% at Intro level. That should hurt, right? Not at all! 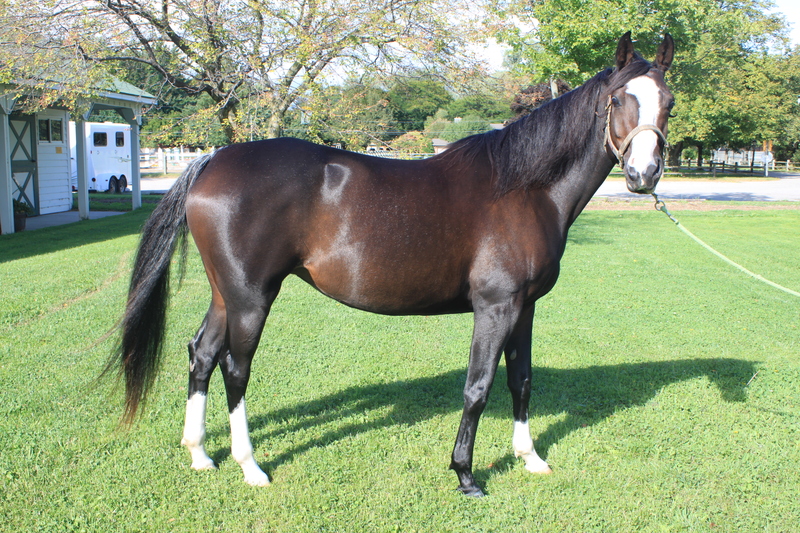 She is 90 days under saddle and had never been away from “home”. You know what else, the judge took the time to tell Trainer E (who was of course riding) that she thinks she rode the horse well and to come back. The judge I watched most of the day (who judged Nibbles) was nice to other riders as well. She made small talk with them when they entered and thanked each and every one of them at the end of their test. She was smiling and she was kind. It was clear she made it her goal for everyone to have a positive experience. If you want to make fans of your sport, that right there is how to do it. Did Nibbles keep it together? Most of the time barely. Did she show off her mad skillz? Absolutely not. Will I do it again? Yes, tomorrow, please, as soon as possible! 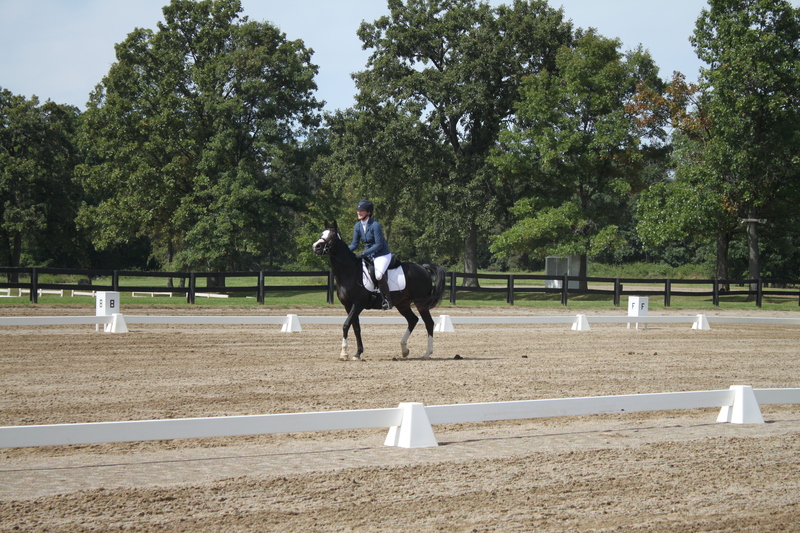 All in all, Nibbles’ first dressage show is in the books and only made me hungry for more. 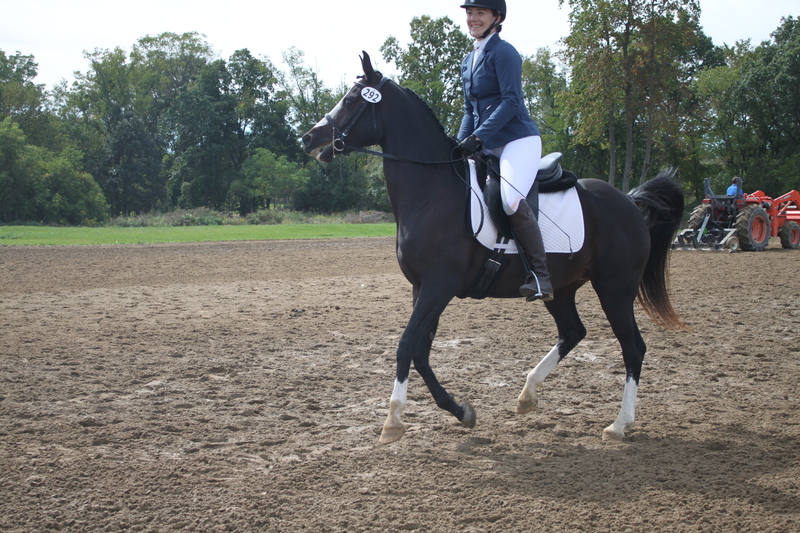 One day, she will trot down the centerline like a civilized pony. This day was not that day but we made a deposit in the confidence bank and had a lot of fun doing it. We last left our heroes in the warm up ring by themselves. Nibbles was very tense and thought going sideways was the answer to leg. Again, Trainer E showed a lot of wisdom and was careful about which fights to pick and which to let go. By the time they were to go into the ring, we had forward reinstalled but Nibbles’ preferred to go around with her nose in the air and all the tension thank you very much. 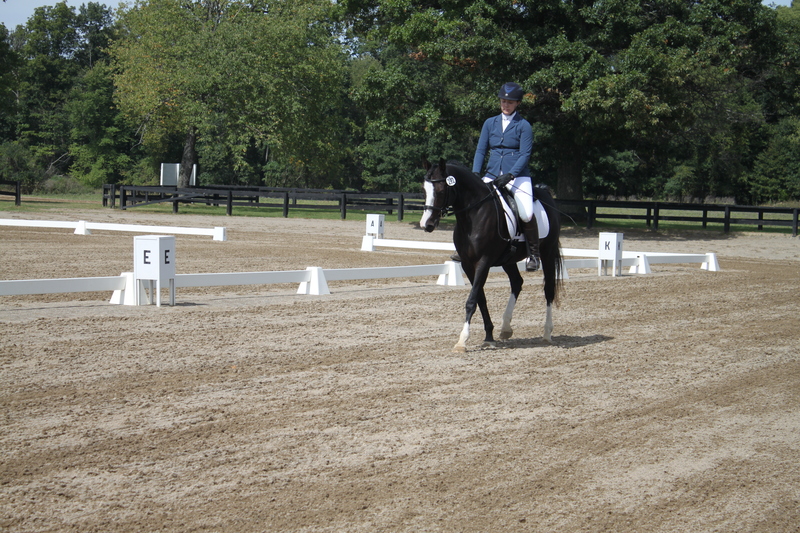 I present to you what is possibly the most tense baby dressage test ever. If scores for “tranter” were a thing, she would have nailed it. Alas, they are not a thing and she nailed almost nothing. I had a blast watching. I cheered like a lunatic when they saluted. She stayed in the arena (although around 1:16 in the video you can see she thinks about it) , she didn’t kill her trainer, she didn’t injure the judge. Huge massive baby success! I don’t think you can hear it on the video but the judge is totally and completely nice. At the end of the test, she thanked Trainer E and sagely added, “This is where it all starts.” Trainer was really pleased with her and concurred it was a good first experience. Super-de-duper tense but a positive learning experience and that’s what we were going for. 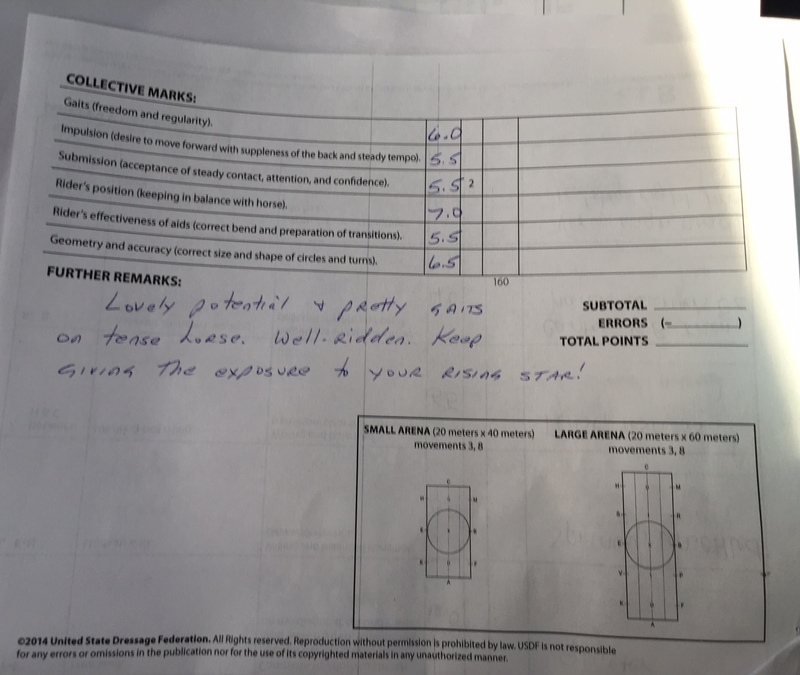 She was scored a fair 54.8%. and pinned 4th out of 4. She did get a white ribbon so yay unexpected satin (for beating no one hahaha). Her first test was around 8:30am and her second test wasn’t until 1:30pm so we had plenty of time to hang out and watch other riders go. I felt like I was home, even though I wasn’t riding. It hit me how much I missed showing and how glad I was to be back on this path. As they went by, she said “Quick judge us now!” ha! About half an hour before her second test, it was time to head back to the warm up. Things started off spicier than the morning even though she was very laid back in her stall. She didn’t seem too pleased that it was two rides in one day. You horse for the day, I’m done. This photo sums up a lot about the various attitudes. The main warm up only had one other horse in it and was being dragged so in Nibbles went. Go figure, she could care less about the giant tractor. We joked that we wanted to request that she follow it around because she went quite nicely when she could follow it around the warm up. Nibbles got the boot once because she was way behind the leg. That resulted in two pretty pathetic bucks. In her trainer’s words, Nibbles never does anything dirty. Her “no’s” aren’t really no so much as don’t wannas. She said she never feels like she’s in danger which is really awesome to hear because I am not a professional and this is supposed to be fun. I’m totally convinced Nibbles is the right horse for me after seeing what it looks like when her brain explodes. Frankly, it isn’t that bad (although Trainer E made it look like a cake walk sooo). Intro Test B. It seemed to go better to us but the judge was still fair with her 58.0% this time, no surprise satin. Again, tense is the word of the day but I feel like you see a couple nicer moments. I cannot emphasize enough how nice the judge was. She made my day with her comments on the second test. Stay tuned for Part III: the aftermath and overall thoughts! 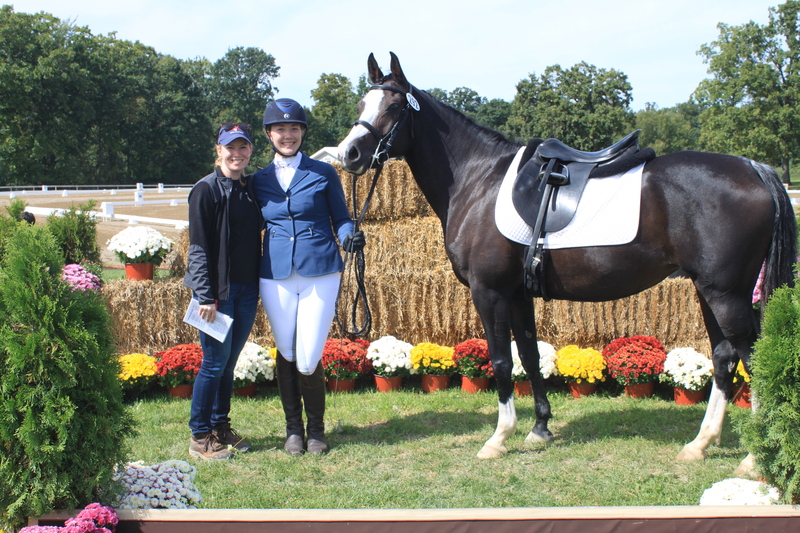 Nibbles’ first show is in the books and was a positive experience for all involved – goal accomplished! The weekend wasn’t without its highlights and struggles though so a blog post or two is in order. Trainer E gave her some lovely rides, tension and all. 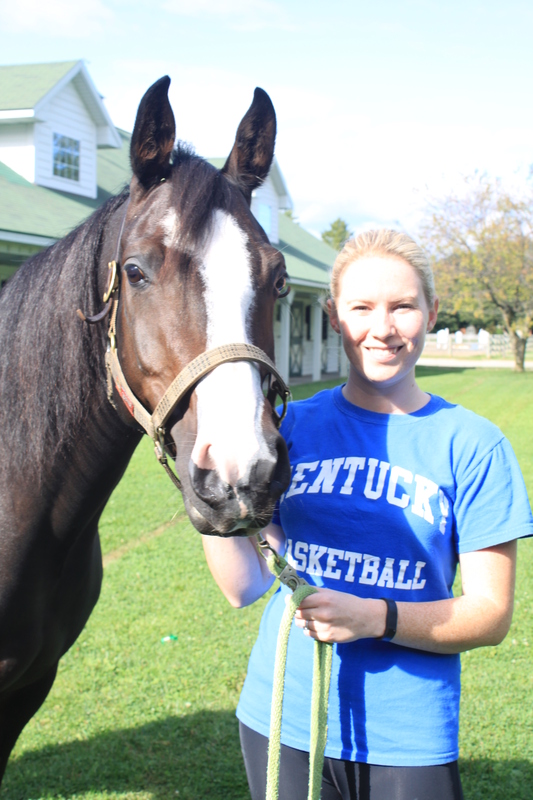 My sister, Leah, and I arrived at Nibbles’ training barn in the early afternoon on Saturday. Trainer E was still teaching lessons for the day so we set out to find Nibbles ourselves and start cleaning her up. The plan was to load her and her barnmate at 6:00pm that day. It took us a while but we finally spotted Nibbles who was missing her fly mask and had her fly sheet halfway off. Oh, mare. Nibbles looked amazing and actually quite clean. Still, this was her first show ever and my first show with my own horse in it in 5 years so I wasn’t about to miss the opportunity to make her shine. Into the bathing stall she went and two thorough baths later, she emerged looking quite brilliant if I do say so myself. Drying in the sun. Not bad for just shampoo and elbow grease. Elise had a lesson show up late so we ended up with time on our hands to kill. Tack was cleaned, necessities were packed, obviously we needed to have a photo shoot. sooo shiny – and she’s getting more and more flecks of white (and has kept the white spot on her belly). sabino? Finally it was time to load the trailer. Shavings, hay, grain, brushes, all the tack, extra pads. It turns out the one thing we really needed but forgot was chairs. I’ll take it. Pony got wrapped (and stood quietly, yay manners) and loaded. She took maybe 10 minutes to get on. It was a step up she’s never seen before and, to her credit, her last trailer ride was 8 hours. She’s never been a trailer that she returned home on except her breeding inspection so I can’t blame her for not being thrilled. At the show grounds, we quickly lost daylight but the mares settled in quickly and without drama. We were pleasantly surprised with how mellow they were. We took them for a walk and let them see the scary white dressage arena. Nibbles had never seen one before, let alone been ridden in one. It was a non-issue. We put them in their stalls and said goodnight, making a pitstop at Panera to finally feed ourselves around 10:00pm. Sunday morning couldn’t arrive quickly enough. Surprisingly, I slept pretty well considering how excited I was. When we arrived back at the show grounds, I opted to talk Nibbles for a walk around the grounds. Remember how mellow she was the night before? lol nope. Let’s just say the rope halter was the only reason I could fly that kite. Hand walking involved a lot of spinning, a little baby rearing, and some screaming (Nibbles, not me). 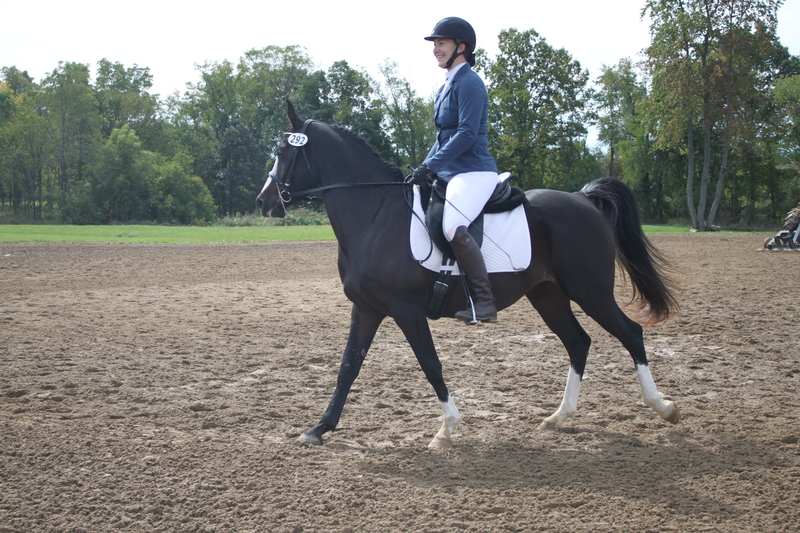 Trainer E came prepared and we gave her a dose of (show legal) Confidence EQ. That seemed to take the edge off. Nibbles was not the first ride of the day. 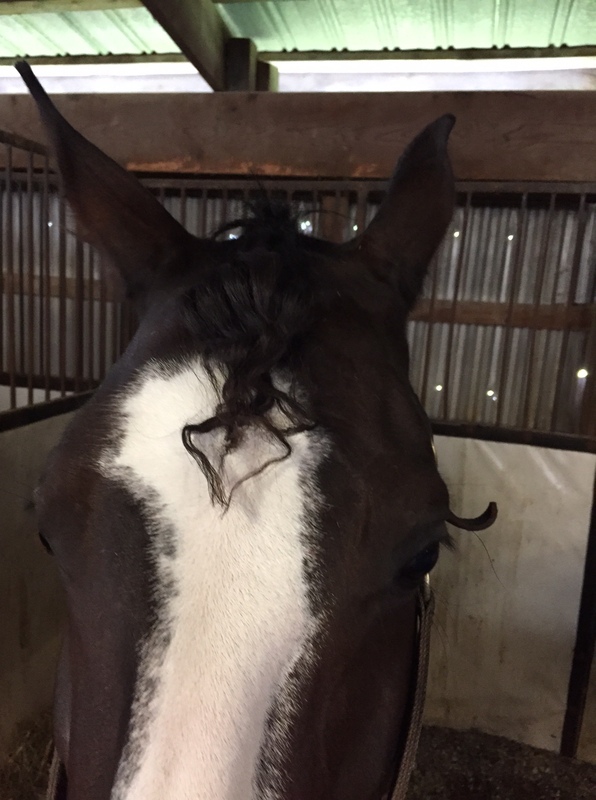 I got nominated as running braider so I helped get her student’s pony ready. I guess I forgot to snap a photo but trust me when I say this pony is adorable. She also has a monster mane and managed to shake out my braid the first time. That’s never happened before. I redid the braid and that lasted the rest of the day. 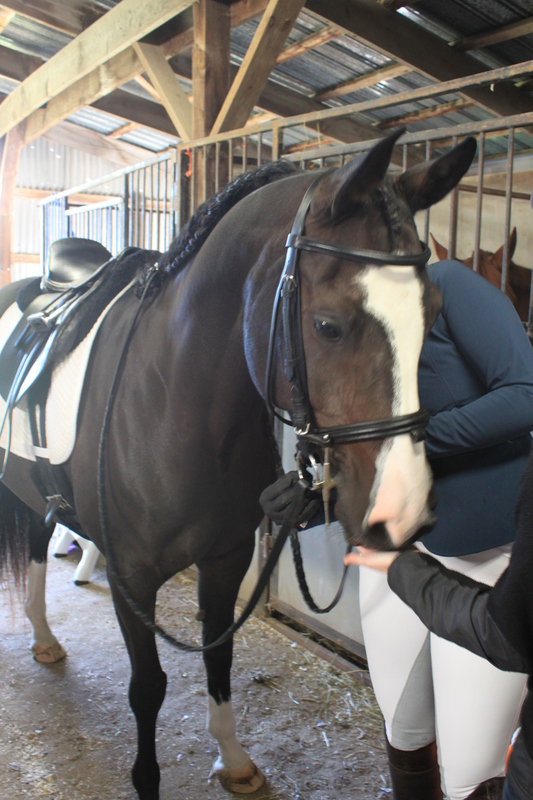 After that, it was Nibbles’ turn to get braided. She was good for her mane but wiggly for her forelock. Luckily, my fingers remembered that they could braid anything, standing or otherwise, so we got it done. She shook out her braid too. I redid it before her second class. 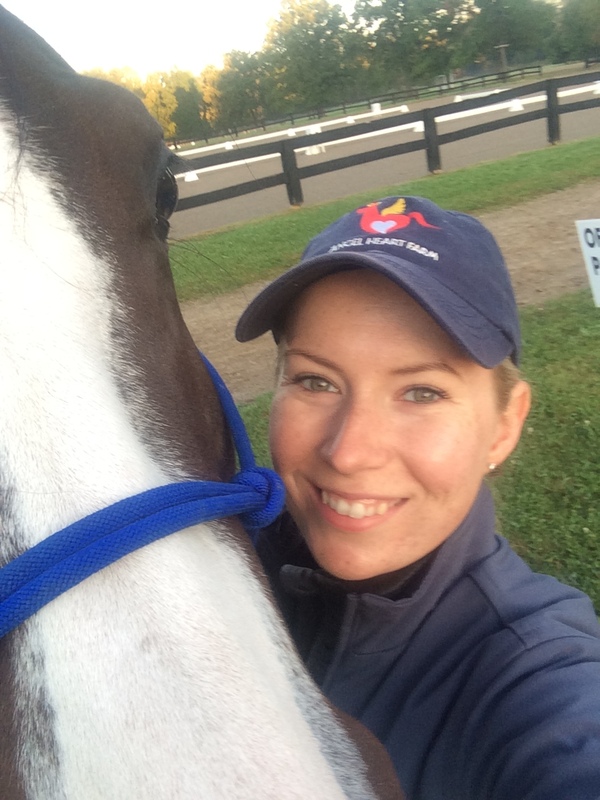 Trainer E had mentioned the night before how calm the warm up usually is at Woodbine. Famous last words, when we took Nibbles out about 20 minutes before her class, there were about 20 horses in a moderately sized area. You could see the gerbils in Nibbles’ brain start to panic so we opted for a different warm up ring that no one else was using. Given it was right before her first test ever, Trainer E wisely picked her battles and decided the warm up area was one for another time. Up next: the actual tests! Bad blogger is bad. I’ve been in and out of the doctor’s office several times over the past two weeks with some random health issues and am back in physical therapy for what I thought would be my knee. It turns out my hips, specifically my gluteus medius (the muscle along the outside of your hips), are extremely weak and my knee just tried to compensate this time. I’ve been banned from posting in the saddle temporarily until they clear my tendonitis in my knee so I haven’t been back for another lesson. Hopefully in the next two weeks! In much more exciting news, Nibbles is heading to her first show according to plan this coming weekend! My sister and I are driving up on Saturday. Nibbles and Elise are doing Intro A and B. The goal is to give her a positive experience. I’m incredibly excited. I haven’t been back up to see Miss Thing since July (arghhhhh) but here’s a video with Trainer Elise up from this past week. Just a quick clip of trotting but I have still been drooling. I think you can see her trying to reach for the contact, although she clearly isn’t there. 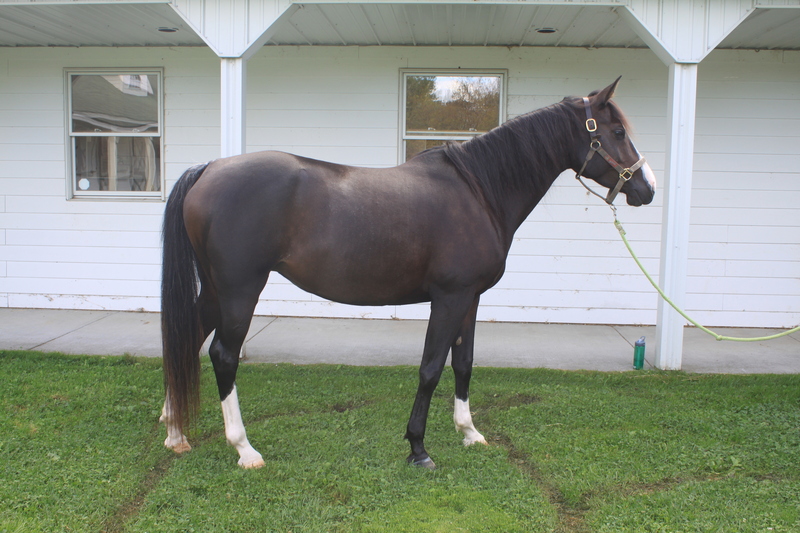 This is almost exactly 90 days under saddle. 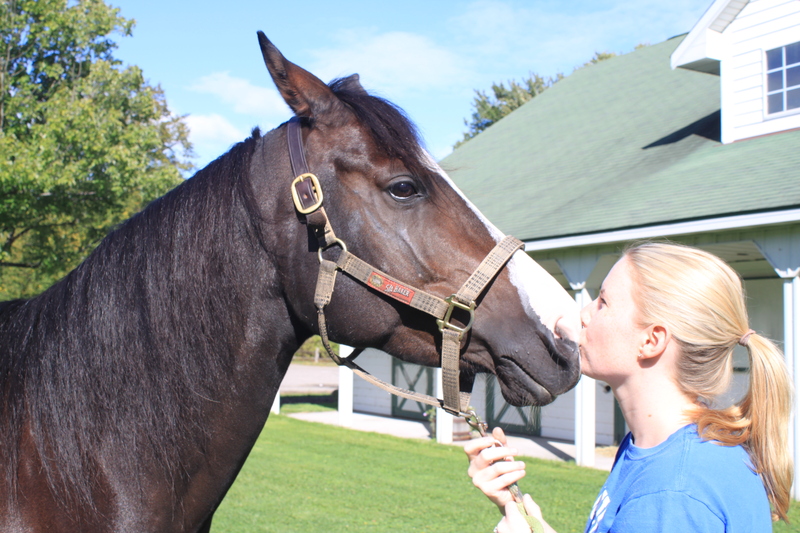 After much talking and exploring of options, Trainer Elise is going to keep Nibbles through the winter, probably until mid-March 2016. It’s a long, long time to be without my girl but I think she will benefit from it immensely. Elise has been so generous in making the dream of full training a reality for someone who doesn’t have a full training budget. As soon as my physical therapist clears me, my goal is to take bi-weekly lessons like I said before but that means my personal goals with Nibbles will change since she’ll remain in professional training longer. Pretty boring update. You can expect gratuitous pictures from the show. 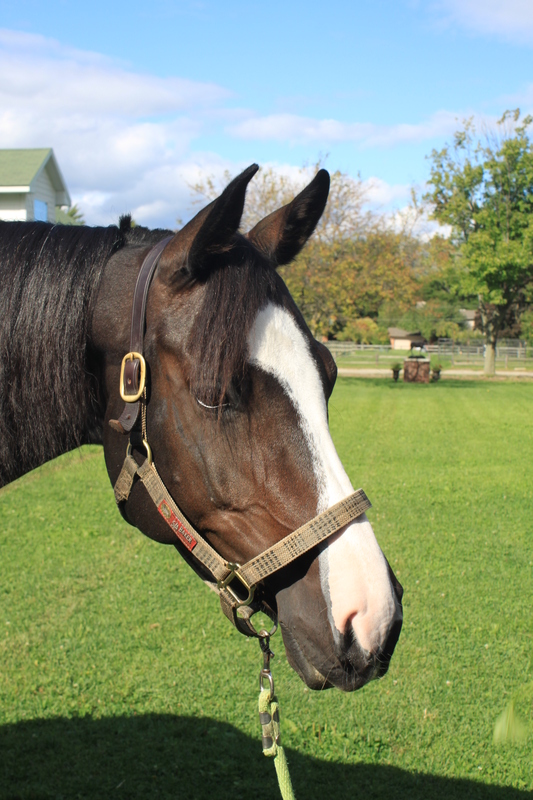 My sister is bringing her fancy camera and has an incredible eye for shooting ponies.